Meg Griffiths, our Belize kitesurf instructor sent us a description of her recent busy weeks on the island. When a kiter imagines their ideal, fantasy kite location they undoubtedly think warm, clear water, 15 knots, white sand, palm trees and good beer. Add to that 3km of waist deep sand flats, an isolated dream island with both surf and flat water, plus the occasional giant spotted eagle ray meandering by and you get Long Caye at Glover’s Reef, the best kitesurfing in Belize. The easterly trade winds consistently provide perfect conditions, and a great wind angle for the surf break and flat water spots alike. The sand flats less than 300m from the island provide a perfect teaching environment where we launch from a raft in waist deep water. Shallow, warm water, no other kiters and no obstacles to worry about; students progress quickly with almost 100 % of their kite course being hands on in the water and leave as extremely happy new kitersurfers. Long Caye is also a fantastic freestyle venue, I compete on the British freestyle tour when I’m in the UK and spend my winters training new tricks, this is the perfect place, where else could I find a huge, shallow flat water area, and have it almost all to myself on my days off? 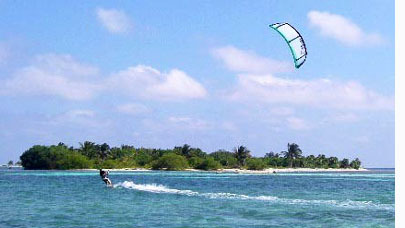 Whether you are a beginner, a wave rider, just want a big kite flying experience or wish to learn unhooked tricks Long Caye is the place. Once you’re ‘kited out’ there is incredible diving just 100m off the island where the atoll drops off to……ft, paddle boards, surf kayaks, surf boards, windsurf equipment, sea kayaks and enough patch reefs to satisfy even the most enthusiastic snorkeler, and of course, some very well positioned hammocks. The team on the island are fantastic and laughs are plentiful, sunsets are stunning, the food is awesome and stars are insane….I’m a very lucky kitesurf instructor! ← Christmas Night Turtle Hatch Out!